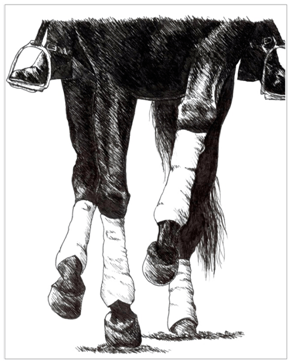 You will often see horses varying the tempo of the gait by speeding up or slowing down. 9 times out of 10 this will be due to them trying to avoid the more difficult flex of the haunches or due to their inability to thrust with the hind legs. Most frequently this can be seen in the form of slowing on the approach to the short side and speeding up again at the beginning of the long side – essentially, slowing on the corners. Another common tempo irregularity occurs during transitions. For example in the ‘walk to trot’ the walk gets quicker or in the ‘canter to trot’ the canter gets slower. Likewise, making transitions into and out of lateral movements is where you will see the horse speed up or slow down, but for the most part losing tempo. Whenever this happen, in each case, the unwanted change of tempo is caused by a loss of balance and the inability of the horse to flex. So, before you go pushing your horse through the corners, transitions and laterals, think about strength exercises to develop his ability to flex and bend. Consider whether your horse is capable of the flex and only when you are sure he is you can concentrate on working on the actual tempo and improvement of his tempo. LONG AND LOW FRAME - I’VE GOT THE POWER! Great Patricia, I have been working on impulsion & trying to refine the half halt after your last posts, thanks,,, this post has really seemed to help a lot with rhythm, I also have discovered my horses swing & been playing with it in the sitting trot & posting too,, it’s like she really appreciates me finally getting it right or to stop blocking her natural movement,,,it’s like my seat bones are going left & right & forward & back & more to the left & more to the right depending on which diagonal… now have to try to quiet down the upper body,,,she is much happier since I started playing with the swing.,, it’s so fun too,, cheers Stu.